Rutgers University Press, 9780813575971, 336pp. American novelist E.L. Doctorow once observed that literature “endows places with meaning.” Yet, as this wide-ranging new book vividly illustrates, understanding the places that shaped American writers’ lives and their art can provide deep insight into what makes their literature truly meaningful. Published on the eve of the 50th anniversary of the Historic Preservation Act, Writing America is a unique, passionate, and eclectic series of meditations on literature and history, covering over 150 important National Register historic sites, all pivotal to the stories that make up America, from chapels to battlefields; from plantations to immigration stations; and from theaters to internment camps. 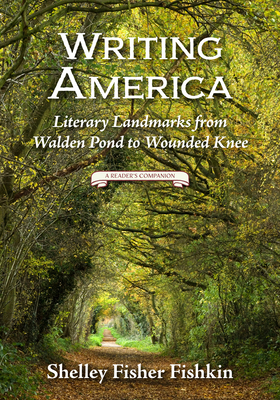 The book considers not only the traditional sites for literary tourism, such as Mark Twain’s sumptuous Connecticut home and the peaceful woods surrounding Walden Pond, but also locations that highlight the diversity of American literature, from the New York tenements that spawned Abraham Cahan’s fiction to the Texas pump house that irrigated the fields in which the farm workers central to Gloria Anzaldúa’s poetry picked produce. Rather than just providing a cursory overview of these authors’ achievements, acclaimed literary scholar and cultural historian Shelley Fisher Fishkin offers a deep and personal reflection on how key sites bore witness to the struggles of American writers and inspired their dreams. She probes the global impact of American writers’ innovative art and also examines the distinctive contributions to American culture by American writers who wrote in languages other than English, including Yiddish, Chinese, and Spanish. Only a scholar with as wide-ranging interests as Shelley Fisher Fishkin would dare to bring together in one book writers as diverse as Gloria Anzaldúa, Nicholas Black Elk, David Bradley, Abraham Cahan, S. Alice Callahan, Raymond Chandler, Frank Chin, Elizabeth Cook-Lynn, Countee Cullen, Frederick Douglass, Paul Laurence Dunbar, Jessie Fauset, William Faulkner, F. Scott Fitzgerald, Allen Ginsberg, Jovita González, Rolando Hinojosa, Langston Hughes, Zora Neale Hurston, Lawson Fusao Inada, James Weldon Johnson, Erica Jong, Maxine Hong Kingston, Irena Klepfisz, Nella Larsen, Emma Lazarus, Sinclair Lewis, Genny Lim, Claude McKay, Herman Melville, N. Scott Momaday, William Northup, John Okada, Miné Okubo, Simon Ortiz, Américo Paredes, John P. Parker, Ann Petry, Tomás Rivera, Wendy Rose, Morris Rosenfeld, John Steinbeck, Harriet Beecher Stowe, Henry David Thoreau, Mark Twain, Yoshiko Uchida, Tino Villanueva, Nathanael West, Walt Whitman, Richard Wright, Hisaye Yamamoto, Anzia Yezierska, and Zitkala-Ša. Leading readers on an enticing journey across the borders of physical places and imaginative terrains, the book includes over 60 images, and extended excerpts from a variety of literary works. Each chapter ends with resources for further exploration. Writing America reveals the alchemy though which American writers have transformed the world around them into art, changing their world and ours in the process. SHELLEY FISHER FISHKIN is the Joseph S. Atha Professor of Humanities, professor of English, and director of American studies at Stanford University. She is also the award-winning author, editor or co-editor of over forty books and over one hundred articles, essays, columns, and reviews. She holds a Ph.D. in American Studies from Yale University and is a former president of the American Studies Association. "A vibrant and thoughtful guide through American literary history." "There is no one better suited to illuminate the connections between America’s great authors and the places in which they built their writing and their lives than Shelley Fisher Fishkin; give yourself a thoughtful treat and keep this book by your bedside to dip in and out of as the mood strikes." "The depth of Fishkin's knowledge and the dynamism of her enthusiasm elevate this 'reader's companion' from superb resource to lustrous and delectable." "A must for book-loving travelers of the armchair and more intrepid kinds." "Meeting at the intersection of physical place, history and literature, Writing America brings readers along for the ride, pinpointing the locales that fueled the imaginations of some of our most important writers." "Using the National Register of Historic Places as her guide, the author sparks interesting questions regarding how writers influence, and are influenced by, place … Fishkin's book offers a diverse look at our nation's literary landscape and history." "The Langston Hughes House, the Angel Island Immigration Station, and Hollywood Boulevard…they're all here, having influenced the writing of America's great literary geniuses. But the most poignant and memorable pages aren't about buildings and places; they're about the daily lives, crises, and interactions that motivated these writers to record fascinating, beautiful, and painful passages of history." "Perfect for the armchair traveler or the reader who enjoys hitting the road, Shelley Fisher Fishkin’s Writing America is a meticulously researched, beautifully written survey of the nation’s most beloved literary sites ... A vivid mosaic of the cultures, voices and geographies that inform America’s literary inheritance ... It’s the ultimate trip advisor for lovers of literature and history." "Big, handsome, well-illustrated ... A book to own and read over and over again." "Writing America is a triumph of scholarship and passion, a profound exploration of the many worlds which comprise our national canon . . . a book that redraws the literary map of the United States." "Shelley Fisher Fishkin is the best guide you could have through American literature and the places that inspired it. She writes like an angel. She appreciates the diversity and humor of the American spirit. Read her!" "Writing America is designed for those who love not only literature, but also history and landscape, and the conversation they have with one another. I could not stop reading." "Shelley Fisher Fishkin's Writing America is an uncommon travel narrative. Fishkin takes the National Register of Historic Places as a starting point to develop a diverse literary itinerary for the nation … For Fishkin and those who travel with her, literature makes these places and their histories come to life - and this can inspire us all to look anew at the historic places around us." "Writing America is an intelligent, meandering look at the rich interplay between writers and their places… Fishkin writes like a favorite college professor speaks: throwing out quotable lines, grabbing our attention with revelatory anecdotes, making us laugh at the human comedy, making us cry at inhumane injustice - while all the time, whetting our appetite to read more American literature. Highly recommended." "A splendid travel guide for readers." "Through the prism of more than 150 National Register historic sites, this eclectic, essential work honors authors’ voices both mainstream and underrepresented. Thought- and even tear-provoking, Writing America will leave you in awe of the writers whose worlds and words comprise our country’s canon. Lovers of American lit, commence salivating." "An impressive body of exceptional and detailed scholarship. Highly recommended." "Filled to the brim with literary treasures; it is a fine traveling companion for those with a little time to wander - and to wonder about America's literary past." "This book cuts straight to the soul of America in all its shades and colors. I don't think anyone has ever put together a book that’s quite so extraordinary. I certainly have never read one." "Just when you thought you knew American literature, along comes Shelley Fisher Fishkin to show you what you've missed . . . and to make you think about it. She ushers us into both familiar and unusual spaces with prose as accessible as it is learned, observations that are clear and sometimes quirky, and quotations that prove the synergy between literature and place. She takes American literature out of the library and relocates it in the public square, revealing its essence as the most eloquent tour guide imaginable." "What a fine, informative, and welcome book by Professor Fishkin. In brief, a first class piece of work that has been long in coming. It not only deserves a warm reception, it is also to be treasured by professionals as well as by beginners." "This absorbing and wondrous book is a glorious cornucopia of America's literary memory. Writing America is necessary, delicious, and nourishing food for the American artist, reader and writer." "Smartly introduced, lavishly illustrated, and beautifully designed, Writing America treats the reader to sites associated with American authors and puts houses, landmarks, memorials, and museums into a vivid relationship with texts." "Writing America presents us with an exquisitely rendered geography, in word and image alike, of the nation's diverse literary heritage."